On the tram home today from my evening journalism class, my brainstorming for an idea for our first hard news story (due next week) was interrupted when the driver announced he'd be diverting from Swanston street "due to a blockage." In one collective huff my fellow commuters and departed the tram and set off straight ahead on foot. 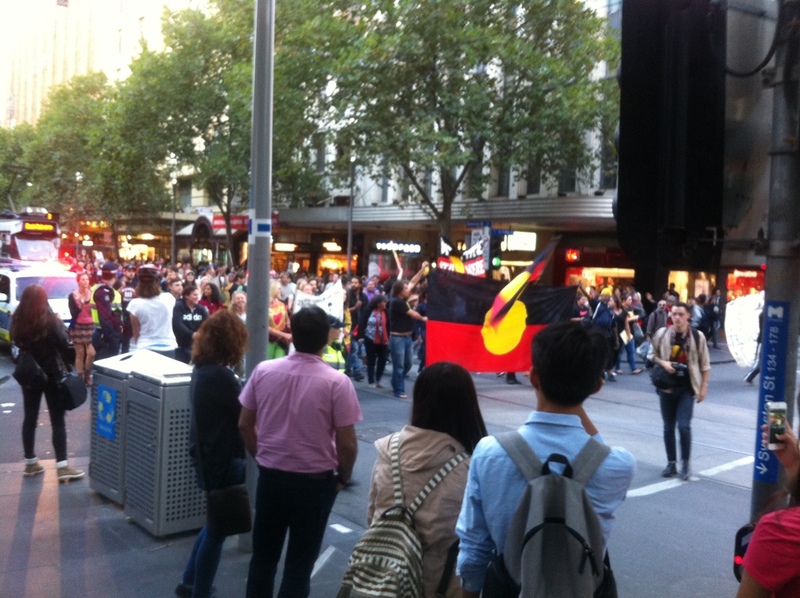 Not long after resuming my contemplation, wishing for a stroke of miraculous inspiration for a hard-hitting news story that would blow away my peers and teachers, I found myself among a crowd of hundreds of fiercely chanting Aboriginal rights activists "brandishing signs" reading such things as 'stop black deaths'" (Landy, Herald Sun 2015). To activist: "Why are you joining this rally this evening?" To policeman: "Were you aware this rally was to take place this evening?" I imagined, if only I'd had the guts to ask these questions. It wouldn't have been awkward if I'd asked them confidently, and I'd have a prime news story to offer up for my assignment. If only I'd had the guts.